In a nutshell: Massive shark do do do do do do, ate a shark do do do do do do, it got found do do do do do do, scared locals. Anyone who has seen Jaws and spent sleepless nights keeping their feet firmly within the confines of their bed will know there are some absolute tanks swimming about in our oceans. While the films are merely fiction, someone has come across some evidence suggesting a so-called super shark is out there and coming for the other regular-sized sharks. A fisherman called Jason fished out the decapitated head of a huge shark he claimed to be a mako in waters off the coast of Sydney, Australia. 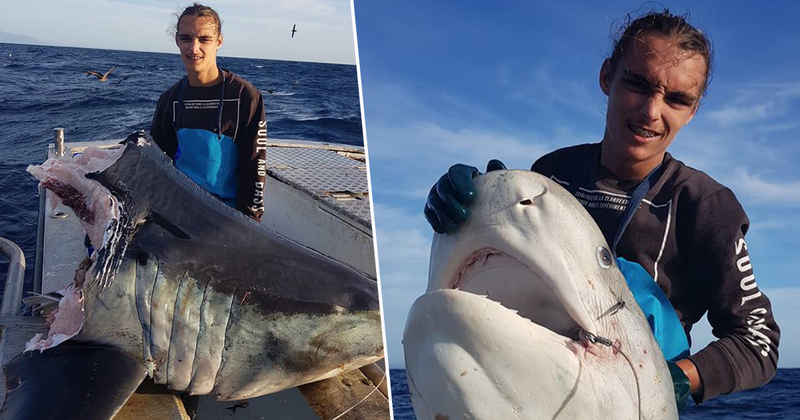 Jason – who’s known as Trapman – was fishing near Bermagui, a town in New South Wales, expecting to catch a much smaller beast with a little more bite. Jason shared his findings to Facebook in the hopes of finding out what sort of amazing beastie could’ve contributed to the Mako’s untimely death. So this was all we got back of this monster mako. Unfortunately we didn’t see what ate it but must of been impressive!! The head was about 100kg. It was a crazy morning of shark fishing. Hoping to catch smaller sharks but just hooked big sharks that got eaten by bigger sharks again. While many observers joked they speared the shark themselves, amid the Sharknado and Finding Nemo references aplenty, some members of the Internet Jury actually came up with some insightful suggestions among the usual tomfoolery online. Makos are the fastest shark in the ocean, so some speculated – if it died by another animal – its attacker must have been quick. Greg Doble reckoned it was more than one Great White, reasoning ‘you can see the smaller conveyor teeth outside major bite marks’. Thus, he suggested it wasn’t an Orca, as some had mused, because ‘they tend to eat just the liver of large sharks and let the rest drop to the ocean floor’. One of the world’s largest set of shark jaws comprised of about 180 fossil teeth from the prehistoric species, Carcharocles megalodon, which grew to the size of a school bus. Maybe he’s come back to play? Maybe we’ll never know. Maybe the carcass will get taken for testing at a lab out in the middle of the ocean, where its family will come looking for vengeance, so Hollywood can make a really slapdash film about the stranded scientists trying to survive. Maybe not.